-v. 5, no. 9 (July 29, 1886). Description based on: Vol. 2, no. 14 (Sept. 6, 1883). The McCook Tribune served as a prominent news source for the Red Willow County seat of McCook, Nebraska, and much of its environs. J. P. Israel served as publisher and editor for the McCook Weekly Tribune, which debuted on June 8, 1882. Just over a year later, on November 8, 1883, Frank M. Kimmel and E.M. Kimmel assumed ownership of the paper. On August 5, 1886, the Kimmels condensed the title to The McCook Tribune. The paper continued as a weekly until 1924, when it shifted to a consistent triweekly schedule. The Tribune charged $2.00 annually regardless of publication schedule. The Tribune maintained a five-column layout and ran approximately six to seven pages in early editions, later expanding to 10- to 16-page spreads. The Tribune's masthead began as a simple bold text, later adopted calligraphic font, and in the end even featured a bubble-letter appearance. At times, it included the subheading "The Official City and County Paper" and "The Newsiest Paper in the [Republican River] Valley." At first, advertisements encompassed much of the front page, leaving actual news to occupy interior pages. With a generally Republican agenda, the Tribune served as Frank Kimmel's personal soapbox on political and economic affairs. Kimmel used the paper to extol the virtues of morality and to help promote McCook and speed its progress toward civilization. The Tribune made a weekly ritual of analyzing the community and its problems and offering guidance for the community's improvement and well-being. 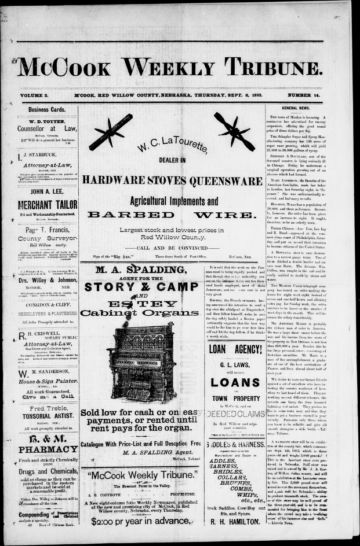 The paper paid special attention to proceedings of the state legislature and Congress, railroad activities, education, and local social happenings. Kimmel proved an outspoken voice on regional issues, attacking gambling, prostitution, and alcohol and reprimanding lawmakers for neglecting the needs of western Nebraska. Frank Kimmel's editorial voice rang clear throughout the Tribune, perhaps more so than many of his contemporaries who filled their pages with second-hand coverage of local and world events. While the Tribune certainly included samples of all such news, Kimmel's contributions mainly took the form of first-person editorials, which earned him recognition as the "crusading editor" of southwest Nebraska and the "unofficial conscience" of McCook. Although E.M. Kimmel helped run the paper in its earliest years, Frank Kimmel remained the primary editor and publisher until his death in 1928. The paper lasted only eight years after Kimmel's passing. On June 20, 1936, rival editor Harry D. Strunk officially absorbed The McCook Tribune into his McCook Daily Gazette.